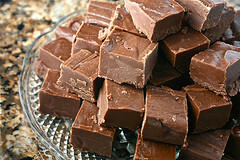 Easy Fudge recipe. Sweet and rich Fudge made with sugar, cocoa, golden syrup, milk, butter, salt, vanilla essence, baking powder, chopped walnuts or ginger. Put in a deep pan sugar, cocoa, golden syrup, milk and salt. Stir well with a wooden spoon and place pan on a very small fire. Do not stir before sugar is dissolved, but with the spoon gently move sugar at the bottom of the pan once in a while to prevent burning. When mixture begins to boil, stir, add butter and keep on stirring. Increase flame a little till mixture thickens. When tiny bubbles appear on edge of spoon and the bottom of pan as you stir, test drops of fudge in a cup of cold water, and if they form soft balls in your fingers, add vanilla essence and baking powder. Remove pan from fire. After five mins. of cooling, beat mixture till it begins to harden. Add walnuts and/or pickled ginger and quickly pour on to greased square tin. When cool cut into squares, and desired size.